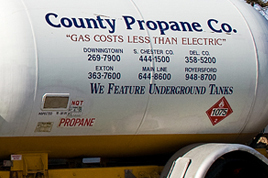 County Propane Company is an independent business servicing customers in Delaware, Chester and Montgomery counties since 1984. We are proud to be celebrating over 28 years of dedicated service. We specialize in both residential and commercial propane usage. Our home services include home-heating, hot water, gas cooking, gas fireplaces, room heaters, gas dryers, swimming pool heating and generators. We also provide LP gas tanks in sizes that range from one hundred to one thousand gallons for both your home and business. We specialize in new construction and provide underground tanks. We have experienced delivery drivers and servicemen available for our customers 24 hours a day, 365 days a year. Normal business hours are 7:00am to 5:00pm, Monday thru Friday, with after-hours emergency service available.